A pipefitter or steamfitter is a tradesperson who installs, assembles, fabricates, maintains and repairs mechanical piping systems. Pipefitters usually begin as helpers or apprentices. Journeyman pipefitters deal with industrial/commercial/marine piping and heating/cooling systems. Typical industrial process pipe is under high pressure, which requires metals such as carbon steel, stainless steel, and many different alloy metals fused together through precise cutting, threading, grooving, bending and welding. A plumber concentrates on lower pressure piping systems for sewage and potable water (tap water), in the industrial, commercial, institutional, or residential atmosphere. Utility piping typically consists of copper, PVC, CPVC, polyethylene, and galvanized pipe, which is typically glued, soldered, or threaded. 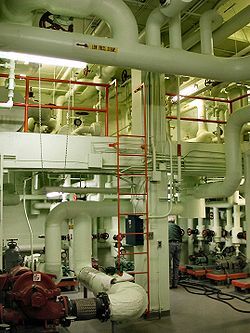 Other types of piping systems include steam, ventilation, hydraulics, chemicals, fuel, and oil. In Canada, pipefitting is classified as a compulsory trade, and carries a voluntary "red seal" inter-provincial standards endorsement. Pipefitter apprenticeships are controlled and regulated provincially, and in some cases allow for advance standing in similar trades upon completion. In the United States, many states require pipefitters to be licensed. Requirements differ from state to state, but most include a four- to five-year apprenticeship. Union pipefitters are required to pass an apprenticeship test (often called a "turn-out exam") before becoming a licensed journeyman. Others can be certified by NCCER (formerly the National Center for Construction Education and Research). Pipefitters install, assemble, fabricate, maintain, repair and troubleshoot pipe carrying fuel, chemicals, water, steam and air in heating, cooling, lubricating and various other process piping systems. Pipefitters are employed in the maintenance departments of power stations, refineries, offshore installations, factories and similar establishments, by pipefitting contractors. In North America, union pipefitters are members of the United Association. Wages vary from area to area, based on demands for experienced personnel and existing contracts between local unions and contractors. The United Association is also affiliated with the piping trades unions in Ireland and Australia. ^ www.tru.ca, Thompson Rivers University. "Steamfitter / Pipefitter: School of Trades and Technology". Thompson Rivers University. Retrieved 2019-02-19. ^ https://tradesecrets.alberta.ca/trades-occupations/profiles/0074/ Steamfitter/Pipefitter Trade Profile. Alberta Trade Secrets. 1995-2010. ^ "Explore Careers by Occupation - Job Bank". 0.hrsdc.gc.ca. 2017-01-31. Retrieved 2017-02-23. ^ a b c Will Charpentier, Pipe Layers vs. Pipe Fitters, Demand Media.